ESCANABA — Michigan’s Delta County-owned parks will open this spring to a host of improvements made in the last three to four years. The Delta County Board of Commissioners had two goals with the improvements, says vice chair Mary Harrington: (1) to make the parks financially self-sufficient; and (2) to make the parks more attractive to tourists and residents both. An avid camper herself, Harrington says she believes they’re succeeding. 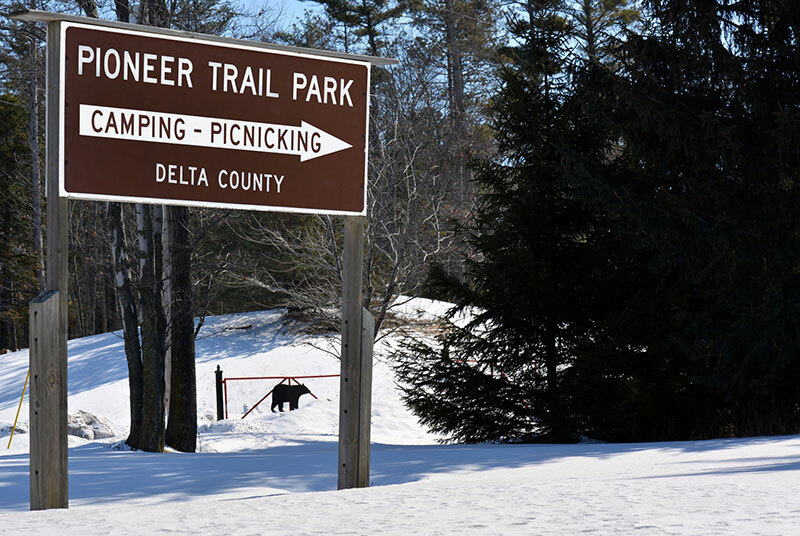 Delta County owns four parks, including two with campgrounds considered to be the “bread and butter” of the system: Pioneer Trail Park and Campground on the Escanaba River, about midway between Escanaba and Gladstone; Fuller Park and Campground on Lake Michigan and the Bark River, about 16 miles south of Escanaba; Sac Bay Park on Big Bay de Noc, near the south end of the Garden Peninsula; and Rapid River Falls Park, on the Rapid River north of the town of the same name. Sac Bay and Rapid River are day parks only. All the parks have been managed and maintained by the Delta Conservation District (DCD) since late 2010. The DCD also manages county forestland for the board. Rory Mattson, executive director of the DCD, explains saying, “The infrastructure was shot.” At Pioneer Trail Park, in particular, “the electrical was a nightmare,” and some of the restrooms were so dilapidated as to draw media attention. Almost immediately, the water and electrical systems at Pioneer Trail were upgraded and several RV camping sites added, including some pull-through sites big enough to accommodate even luxury motor coaches. Eighty of the 96 RV sites now have not only 50-amp electricity (up from 20- and 30-amp), but water and access to WiFi and cable television service. some kayaks were made available for rent. The old open-air pavilion at Pioneer Trail Park is being repaired now, and a new, year-round pavilion, with restrooms and a full kitchen, is expected to open beside it in time for the Independence Day holiday. Likewise, a second RV dumping station is planned for the park, and another nine holes will be added to the disc golf course. Pioneer Trail Park has also started hosting themed events for registered campers. An Easter event, including an egg hunt and a demonstration by the Upper Michigan Raptor Rehabilitation and Wildlife Center, is set for June 21, and a Halloween event, with trick-or-treating and a haunted house, for September 20.
pulling out tree stumps and leveling all the RV camping sites. A new 10-site rustic campground is expected to be in place at Fuller by opening time, and some picnic tables placed near the flowing well there. Mattson estimated the total cost of improvements to the two parks so far at about $400,000, most of it paid for with income generated by the parks themselves. He says attendance is up and campground revenues have almost doubled, as a result of the changes. The parks have benefited from gifts, too, from grants from the Michigan Department of Natural Resources Trust Fund, and, to a lesser extent, from the sale of firewood at Pioneer Trail, and proceeds from the camp store. In addition, local businesses are invited to sponsor holes on the disc golf course, in exchange for having their names appear on maps and on signs yet to be installed.Harrington says the county appropriates just $50,000 a year to the parks, largely to pay the full-time parks manager’s salary and for one seasonal worker. Mattson and the DCD administrator are paid by the DCD, and any summer Michigan Youth Corps workers by the state. Tentative plans for Sac Bay this year are to fix the beach, repair or replace the vault toilets, and repair the changing building. Longer term, Mattson anticipates developing a rustic campground on the property, and building two rental cabins to make money for that park. “The Rapid River day park is in pretty good shape,” he says, but some picnic tables may be added to it, and a theme park is under consideration for 2017 or 2018. Camping fees, seasonal contracts and more information about the parks can be found on the Internet at www.deltacountyparks.com, or call 906-786-1020. The parks will be open for five months, May 12-Oct. 12, when office hours will be 10 a.m.-8 p.m.
Share the post "Improvements make Delta County parks more self-sufficient, attractive"